Apparently I am on a wicked sweet and salty kick with baked goods. First an apple cheddar pie, now this. Let's rewind shall we? Where did this all get started? I blame it on Alton Brown and Netflix. After a week of binge watching Good Eats, my mind was swirling with ideas. Especially after an episode where Alton makes bacon praline. Bacon praline! For snacking! What?? He's a horrible genius, he is. So I came up with (what I thought at the time was) a genius idea for a bacon praline and salted caramel cake that substituted half of the butter in the cake itself with bacon fat. I might have been a little...overenthusiastic. I made the cake. I didn't like it. It turned out to be too much. Butter + bacon grease in the cake, butter in the swiss meringue buttercream, butter in the caramel sauce, all topped with a crapton of bacon praline. Too. Much. To. Handle. I had Phillip take the cake with him to work the next day and after the initial shock of realizing there was bacon on a cake, it did receive a warm reception from his coworkers. I still didn't really like it though. Now I'm left with a whole pound of unused bacon in the fridge since I was also a little overenthusiastic while grocery shopping and bought twice as much as I needed. Keep in mind that at this point I was pretty sick of bacon and didn't really want bacon with my eggs in the morning or bacon on sandwiches or bacon on anything else that you would normally have it on. Then another idea came to mind. Bacon cinnamon rolls! They're both kind of breakfast-y and would go perfect together. I thought I was so clever. Unfortunately a quick google search taught me that I wasn't as brilliant and original as I thought, and plenty of people have already done this before. Ah well, still made it, and this time it came out much better than the bacon cake. You can refrigerate the un-proofed rolls overnight if you're planning on baking them the next day. Right after cutting out individual rolls and placing them in a baking pan, cover and place in the fridge. The next morning, let them come back up to room temperature, then proceed as usual. I would not recommend refrigerating for longer than one night. I must also mention that having done both methods, I think the rolls taste better and are fluffier if baked the same day. Yields 9 large cinnamon rolls. 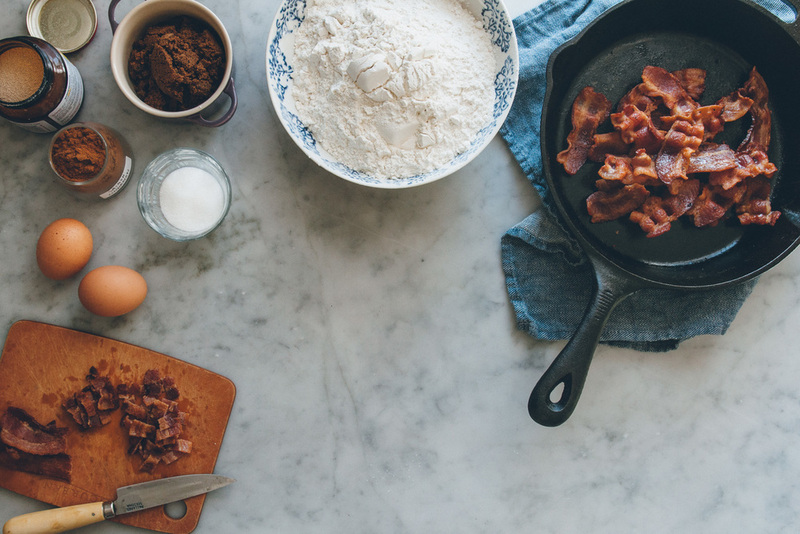 In a cast iron skillet, cook bacon in batches on medium heat until crispy and most of the fat has rendered out. Let cool for 5 minutes then chop or tear the bacon into bite sized pieces. Transfer to a bowl, cover, and set aside. Filter the bacon grease through a fine mesh sieve to remove any burnt solids then transfer to a small bowl and place in the fridge for 15 to 20 minutes until it has cooled to around room temperature and become opaque/spreadable. In a liquid measuring cup, sprinkle yeast and a pinch of granulated sugar over warmed water. Stir to combine and let sit for 10 minutes until frothy. Meanwhile, place the remaining granulated sugar, 6 tbsp rendered bacon fat, and salt in the bowl of a stand mixer. Beat with the paddle attachment on medium speed until light and fluffy, 3 to 4 minutes. Add eggs one at a time and mix until just incorporated, scraping down the bowl after each addition. Add two cups of flour and mix on low for about 30 seconds. Add milk and yeast and continue mixing on low until well combined, about 1 minute. Switch to the dough hook and add the remaining flour, starting with the lesser amount. Mix on medium low until the dough starts clearing the sides of the bowl. If it is still sticking after 2 to 3 minutes, add more flour a tablespoon at a time. Once it comes together, the dough should be slightly sticky but still soft and supple. Transfer it to a lightly floured counter and knead it by hand a few times over. Place the dough in a clean bowl, cover with plastic wrap, and let rise for 1 hour or until almost doubled in size. Mix cinnamon and dark brown sugar in a small bowl. Transfer dough to a well floured counter and roll it out until it measures approximately 10 by 15 inches. 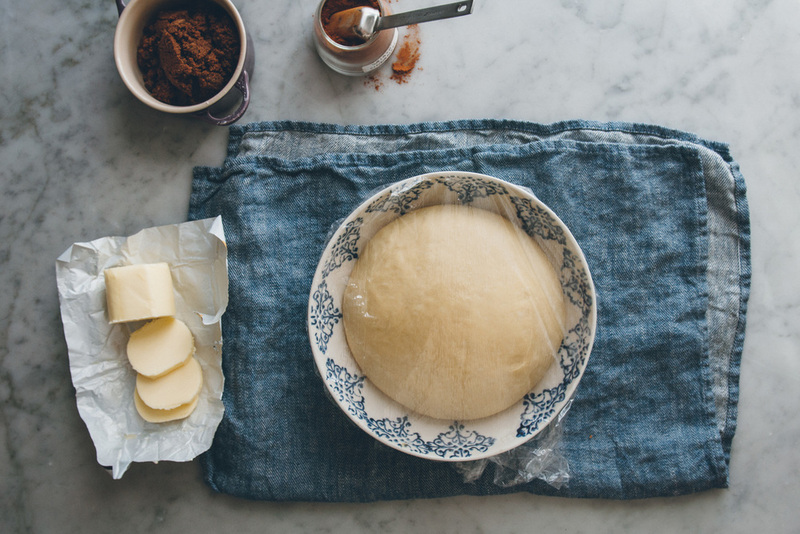 Spread butter in an even layer over the dough. Then sprinkle the cinnamon sugar mixture on top. Roll the dough lengthwise, pinch the seam to seal, and cut it into 9 even pieces. Place the rolls in a parchment paper lined baking pan (I used a square 10 by 10 pan), cover again with plastic wrap, and let rise for another hour until puffy and doubled in size. 15 minutes before baking, heat your oven to 350 degrees F.
Bake for 30 minutes until golden on top. While your rolls are baking, make the glaze by whisking together confectioner's sugar, 2 tbsp milk, 2 tbsp melted bacon fat, and a pinch of salt. Cover and set aside until ready to use. By now your bacon pieces are probably cold; you can warm them up placing your bowl of bacon in a microwave for 10 to 15 seconds. Once the rolls are done, take them out of the oven and let cool for 15 minutes. Drizzle with glaze, top with bacon, and enjoy immediately.